PARTICIPATE IN OUR MAY 12TH DAY OF ACTION! 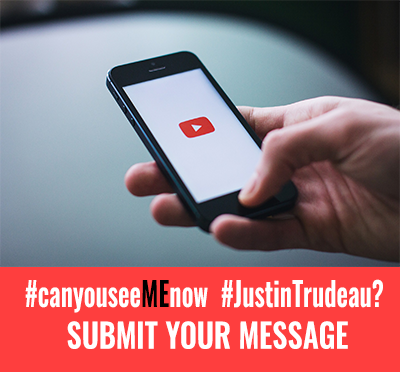 BE PART OF THE #canyouseeMEnow? GLOBAL MILLIONS MISSING CAMPAIGN. SEND A VIDEO MESSAGE AND TELL THE PRIME MINISTER TO STEP UP AND TAKE ACTION! the need for testing and treatment access, like Ampligen or antivirals like Valcyte. To make them more shareable, please keep your video to less than 60 seconds. Practice what you are going to say. Feel free to send more than one message to the Prime Minister. Please use the term ME, and not CFS or chronic fatigue syndrome. We are all aware of the deep negative connotation and harm associated with the term ‘chronic fatigue syndrome’. This is our opportunity to consistently ‘brand’ ME…a much easier task than trying to re-brand 3 decades of ‘cfs’. Thanks! Hello Prime Minister Trudeau, my name is ____________, and I live in _____________, and I have been sick with ME for ____ years. It is important for you to see me, and see ME, because…. Need a bit of advice how to record your video? Click here for a guide on how to record your video! Fill out the form & upload your video below, Millions Missing Canada will be editing your videos and publishing on our social media to share! Who is your local MP?